What's the difference between Fairtrade and Fairwear clothing? To view your quote you first need to activate your account. After you have filled out your email address we automatically send you an activation code to your email address. Some email programs might put this in your spam folder, so please check there. Once you activate your account all your quotes can be accessed via the button on the top right of your screen. Simply select the product you want wither using our extensive catalogue or use the quick quote button on the top right of the screen. Then click the quote me button and tell us what you want on the garments. We have video instructions on getting a quote if you need some help. We believe are prices are highly competitive, however there will always be someone out there that will undercut anybodies prices. At Shirtworks our print and embroidery quality is exceptional, we take pride in what we do and our attention to detail is second to none. To get a great quality print takes skill and time, if a print needs an extra process to achieve bright solid colours then we do it. Our customers are our biggest advert and 97% of them would use us again. Shirtworks will always try and price match on a competitors quote but we will not compromise on our quality. Our turnaround time is normally within 7 to 10 working days, for printing and embroidery from receipt of your purchase order, payment and artwork, but we can sometimes meet urgent deadlines. Of course it is not always possible to give us 7-10 days notice and we can work with almost any deadline, and we can provide a 48 hour service (our quickest turnaround has been less than 24 hours!) Rush jobs of 7 days or less can often be accommodated but may be subject to a surcharge. There is a table showing rush order charges at the bottom of your quote. Any changes made to your order after you place it might cause delay and may incur further charges. Pleaase allow a further 3-4 weeks if you want your garments relabeled. We are able to make use of most designs or images that you send us – even a rough sketch! However, if your design requires work by our artwork team to make it useable for screen printing or embroidery, then additional artwork charges may apply. For simple image amendments or ‘tidying up’ we will normally not make a charge. For complex designs are new creations by our artwork team, our costs are £25 per hour plus VAT. If you are unsure just send your artwork file in to us for assessment. We are able to use most file formats but our preferences are illustrator or photoshop files (ai, eps or pdf). However, if you have a good quality jpeg or word document image then this should suffice. If you need a garment sample/s prior to placing an order please ask our sales team. We are more than happy to send these out if required. Sample costs vary depending on the garment. If you want to return the samples we charge a 15% handling fee and you'll need to pay for return postage. If any order is placed this fee may be waved. Why do the prices on the website differ from the price in my quote? The prices you see on the website are the plain garment price when brought in full cartons of a size and colour of a garment. These prices are designed to allow you to see how a garment compares against other garments. There are so many variables that determines a price for decoration that it's not possible to display every price option. Absolutely! Once we have received your order and artwork we will create a digital mock-up which will be emailed out to you for signing off. Feel free to ask any questions or make any changes if the customised garment does not look right. Our full catalogue is online. We have so many garments, clothing and promotional products for customisation that it would fill a telephone directory! We are also committed to bringing new products online and our online brochure helps us deliver the latest products to you. Even though the choice is huge our product search facility (top right of our website) makes looking for the right garment or promotional gift a breeze! We can supply individual brand brochure on request for most of the range. We recommend that all customised screen printed and digitally printed garments (including transfer prints) are machine washed at 30 degrees. Embroidered garments can be washed at the same temperature as suggested in the clothing label. When ironing please ensure that any print is ironed from the inside of the garment only! Yes we do. All of our garments in our online catalogue can be ordered without any decoration. Just ask with your enquiry. For screen printing our minimum order is 10 garments. This is due to the lengthy set-up process – any less than 10 would prove to be disproportionately expensive. The good news is that you can mix and match shirts, colours and sizes to get to the minimum number. so you can order 5 t-shirts 3 polo shirts and 2 hoodies. If less than 10 are required we would recommend digital printing. If the garment cannot be digitally printed we can use the vinyl cut application but there are artwork restrictions to this. We have at least 6 price breaks on quantity orders – just ask our sales team. The minimum embroidery order is 10 for your first order, you can reorder lower numbers on subsequent orders. For new customers we operate a pro-forma invoice scheme. Upon receipt of your order we will send out a pro-forma invoice which can be settled by BACS, CHAPS or cheque. 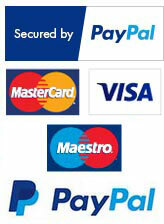 We also accept all major credit cards.